A stroke length of aprox 300 – 400 mm, depending on cart height, usually is sufficient for loading / offloading. 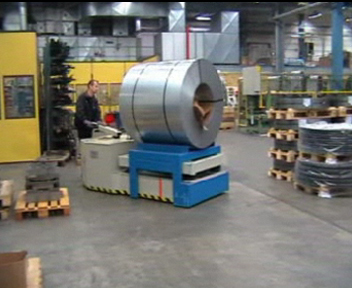 If also coils with very small outside diameters should be loaded to decoilers or offloaded from recoilers, the difference in height can be compensated by means of an attachable prism.These attachable prisms also are available as versions, under which the Coil Transport Cart PTW can drive and can lift it up. Therefore it is possible to handle even such coils which consist of only a few coil windings. With attachable prisms which can be crossed below, it is possible to have available at the decoiler in time that coil which will be processed next. After the last coil will have reached its end, the new one will be loaded onto the decoiler immediately and the production can continue. This way it can be avoided that the operator has to wait for the next coil due to logistic reasons. This Coil Transport Cart is available for coil weight up to 40 tons.